Alone in the darkened house, with only fire's glow and thirteen flickering candles for illumination, silent except for the mounting chords of a Liszt concerto, Rynn was preparing a solemn celebration. Until a knock at the door shattered sanctuary. Who was the little girl who lived in such strange seclusion at the end of the leaf-swept land? Lonely and innocent seeking shelter from a hostile world? Or consummate liar? Each for his own reason, the Hallets were determined to find out. And it was then that the terrible secrets of the house at the end of the lane emerged. 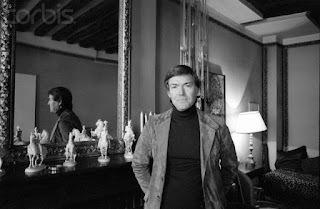 Moving with swift and shocking turnabout to a profoundly disturbing denouement, here is a fine and freezing novel of suspense that probes the subtle bonds of innocence to evil. 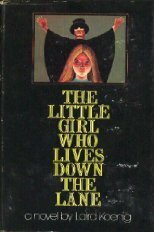 The Little Girl Who Lives Down the Lane by Laird Koenig is a 1974 Coward-McCann & Geoghegan, Inc. publication. Recently I picked up a book called Paperbacks from Hell, which explored horror novels written in 1970s and 80s. The book spoke of various popular horror novel tropes, with the 'Evil Child' being one of enormous popularity. This novel may be one of the best to come out of that boom. While often placed in the horror genre, this book is not a supernatural thriller. But, it is one wickedly tense and scary story! Despite the lack of paranormal elements, it is still a fitting Halloween read. After all, the opening sequence is set on Halloween night, which also happens to be Rynn's birthday. Rynn is a thirteen -year old girl living in a house at the end of a lane with her father. However, Rynn’s landlord seems to regret renting out the house when her creepy son takes an interest in Rynn, a situation that does not go unnoticed by a local police officer, or the teenage boy who forges a very strong, but sinister bond with Rynn. From here, it soon becomes apparent that Rynn’s father is never around, that she never attends school, or goes into the village, but she receives vistors often, most of them unwelcome. I had just begun to take an interest in edgier reading and viewing material when this book was first released. But, it was the movie version that caught my attention back in the mid-seventies. Heavily marketed as a terrifying chiller, I remember feeling really excited about being allowed to watch the movie, only to come away from it feeling let down. At that age, I had yet to develop a strong appreciation for understated suspense and was expecting something far more overt. Mostly, I remember the adults discussing the controversial scenes, which was what I remembered most about the movie, in the years to come. I never realized the movie was based on a book until many, many years later. By that time, book stores seldom stocked it and over time I forgot all about this little gem. But, one day, my husband happened across a hardcover copy in a used bookstore we frequent. Although the book is in excellent condition, sadly, upon closer inspection, it turned out to be a price clipped book club edition, which seldom appeals to collectors, but, I still seized on my chance to finally read this cunning and, in my opinion, under- appreciated and ‘terrifying chiller’. This novel is so twisted and the suspense is often nearly unbearable. While Rynn could easily be tossed into the ‘evil child’ mode, her character is much more complex. She’s wily, clever, and very intelligent. She’s not nearly as sociopathic as some might think. There is a method to her madness, I think. She’s exposed to danger, and not just by having her secrets revealed, which prompts her to do whatever she has to, not just to protect her way of life, but to keep from becoming a victim herself. Rynn embraces her solitude, and is okay with her own company, but she is also lonely, and feels a rush of very intense emotions for Mario the Magician. Their relationship made me squirm and is just as controversial to me now as it was back when this book was first published. The story is very atmospheric and agonizingly tense. Every time a visitor appeared my heart hammered in my chest. Was I afraid Rynn was going to get caught, or was I afraid she would be harmed? Did I, in some small way root for her, or did she scare me to death? The truth is – a little of both. Ultimately, this book is pure genius. The understated quality of it, is part of what makes it so good. The conflicting emotions it evokes left me feeling somewhat unsettled. Our society is much more desensitized than it was in the early to mid-seventies, so this one may not seem as insidious now as it was back then, but I can tell you, I found it downright alarming. I am so glad I found a copy of this book, especially since my much older self really appreciates the fine art this book really is. Overall, this made a perfect Halloween read. Even if you have seen the movie- it goes without saying that the book captures the dread and foreboding much more effectively.